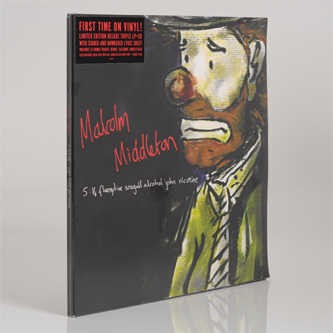 Malcolm Middleton comprises one half of Scottish misery legends Arab Strap. During Autumn/Winter 2001 he felt a wee bit down and had to write some songs. He then recorded a 10 track acoustic album which Chemikal Underground later asked him to transform into something more. The result is his debut solo album ‘5:14 fluoxytine seagull alcohol john nicotine’, recorded With a little help from friends Aidan Moffat (Arab Strap), Jenny Reeve (Eva) and Barry Burns (Mogwai).